Day & Night Nurse Capsules provide 24 hour protection from colds and flu and the associated symptoms such as a tickly, irritating cough, aches and pains, shivering, blocked or runny nose, sore throats and headache. With three active ingredients in the night capsules: paracetemol, promethazine and dextromethorphan, and three in the day capsules: paracetemol, pseudoephedrine and pholcodine, this product will help you sleep AND help you get through the day. Day & Night Nurse Capsules provide 24 hour relief from colds and flu and the associated symptoms such as a tickly, irritating cough, aches and pains, shivering, blocked or runny nose, sore throats and headache. With three active ingredients in the night capsules: paracetamol, promethazine and dextromethorphan, and three in the day capsules: paracetamol, pseudoephedrine and pholcodine, this product will help you sleep AND help you get through the day. 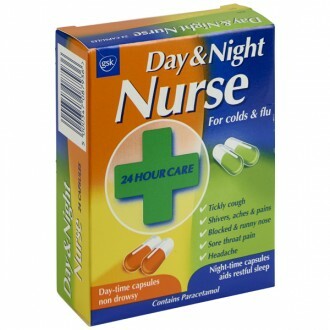 Day & night nurse is a combination pack containing two types of capsules. 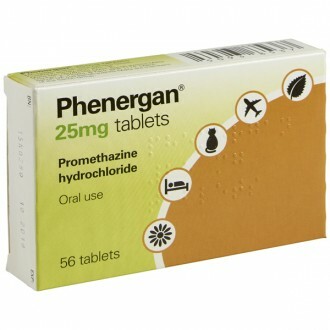 The orange and yellow day nurse capsules contain three active ingredients, paracetamol, pseudoephedrine and pholcodine. The green and white night nurse capsules also contain three active ingredients, paracetamol, promethazine and dextromethorphan. The paracetamol in both capsules is a painkiller that can relieve mild to moderate aches and pains associated with colds and flu. Paracetamol also works to bring down a fever and this stops you feeling hot or shivery. 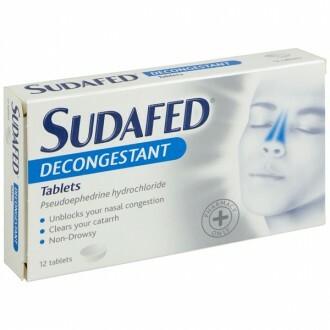 The pseudoephedrine in the day nurse capsules is a type of medicine called a decongestant. It relieves a blocked nose by causing the blood vessels in the linings of the nasal passages and sinuses to contract and narrow. 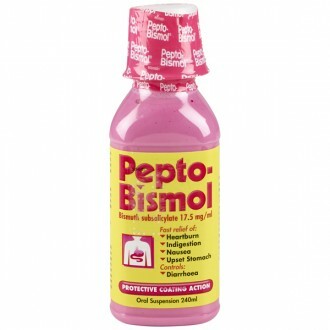 This reduces the feeling of congestion and the production of mucus. The pholcodine in the day nurse capsules and the dextromethorphan in the night nurse capsules are both cough suppressant medicines, used to stop a dry, tickly, unproductive cough (where you don't cough up phlegm). They work by reducing the nerve signals sent from a part of the brain called the coughing centre, to the muscles that produce coughing. This helps stop an annoying or painful cough. 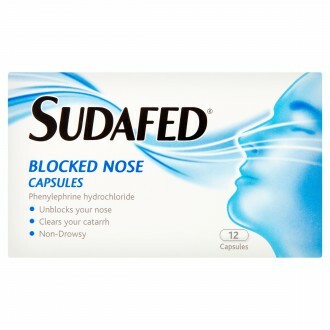 The promethazine in the night nurse capsules is a sedating antihistamine that dries nasal secretions through its antihistamine action. This can help reduce a runny nose and relieve coughs caused by mucus tickling the back of the throat. Night nurse also has its mild sedative effect thanks to the promethazine. Remember to maintain regular body temperature and rest to recover properly. 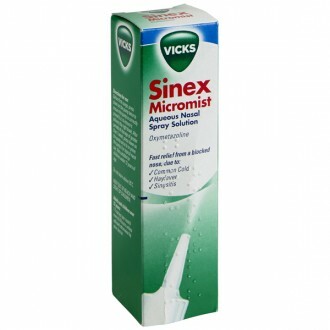 Olbas Oil, Vicks Inhaler or Vicks Vapour Rub can be used for a restful night sleep if extra congestion relief is needed. Each packet of Day & Night Nurse Capsules contains a combination of two different types of capsules, those for use during the day which are non-drowsy and those for use during the night that will help you get some rest and wake up feeling refreshed. The Day Nurse capsules help to relieve aches, pains and fever and are formulated to help you get through the day, while the Night Nurse capsules help to relieve aches, pains and fever associated with colds and flu, they have a mild sedative effect and this, together with the relief from cold and flu symptoms, can help you to get a restful nights sleep. 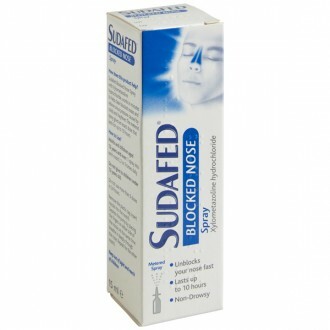 All in one treatment for colds and flu that contains paracetamol. 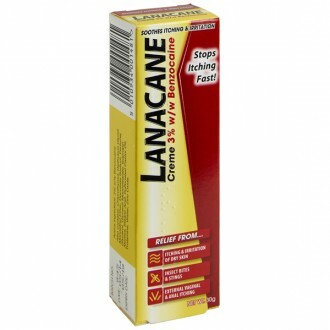 Do not take any other paracetamol-containing product at the same time at this medication. 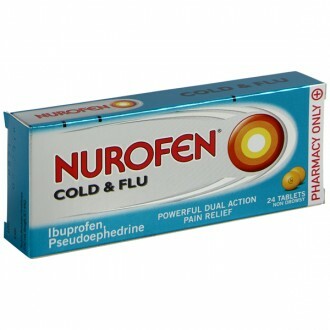 If extra pain relief is needed, ibuprofen or aspirin based products are recommended. 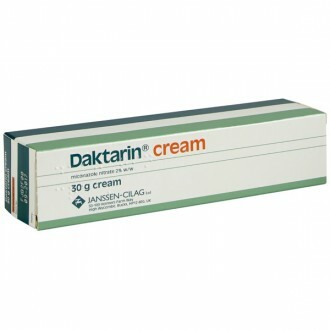 Day & Night nurse is only suitable for adults and adolescents aged 12 years and over. Two Day Nurse capsules should be taken every four hours during the day, up to a maximum of three doses (six capsules) in a day. Two Night Nurse capsules should be taken just before going to bed at night. You must leave at least four hours after taking your last dose of day capsules before taking the night capsules. Do not take more capsules than this - see warnings below. The capsules should be swallowed with a drink of water. They can be taken either with or without food. Do not use for longer than three days without getting medical advice from your doctor or pharmacist. Drowsiness, dizziness, blurred vision, nervousness, hallucinations (particularly in children) have been reported rarely, difficulty concentrating, unsteadiness, clumsiness, headache, dry mouth, nausea, vomiting, diarrhea, constipation, ringing in the ears, irritability, sleep disturbance, loss of appetite, difficulty passing urine, skin rashes, rapid heart rate and shaking. Paracetamol 500mg, Pseudoephedrine hydrochloride 30mg and Pholcodine 5mg. 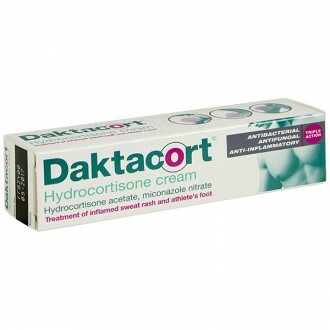 If you have ever had an allergic reaction to any of the ingredients in this medicine. If you have taken monoamine oxidase inhibitors (MAOIs) prescribed for depression in the last two weeks. If you are having a pregnancy test carried out on your urine. Do not take any other paracetamol-containing products. 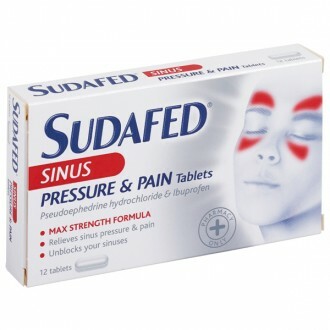 Do not take with any other flu, cold or decongestant product. Do not drink alcohol while using Day and Night nurse capsules. If your symptoms are accompanied by a high temperature, skin rash or persistent headache, see your Doctor. The orange/yellow (day-time) capsules may cause dizziness. If affected do not drive or operate machinery. The grren/white (night-time) capsules may cause drowsiness, dizziness, difficulty concentrating, movement difficulties or blurred vision.. this can affect your ability to drive. It may be an offence to drive while taking this medicine. However, you would not be commiting an offence if the medicine has been taken to treat a medical or dental problem, and you have taken it according to the information provided with the medicine., and it was not affecting your ability to drive safely. Please talk to your Doctor or Pharmacist before taking these capsules if you are taking any prescribed medicines, particularly digoxin (for heart problems), metoclopramide or domperidone (for nausea or vomiting), colestyramine (to lower blood cholesterol), medicines for high blood pressure, medicines which give you blurred vision, a dry mouth or make you drowsy, blood thinning drugs (anticoagulants e.g. warfarin) quinidine or amiodarone (to control your heart rhythm) medicines for anxiety or depression (e.g. selective serotonin reuptake inhibitor (SSRI) or tricyclic antidepressant) or to help you sleep. 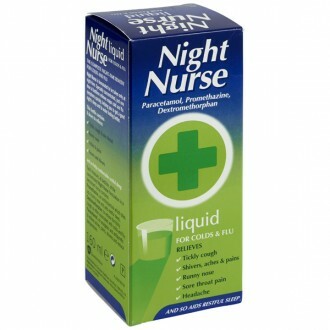 What is Day & Night Nurse used for? The Day Nurse Capsules are a non-drowsy formulation, allowing you to continue with your day-to-day activities. The Night Nurse Capsules have a mild sedative effect, which together with the relief of symptoms, will help aid a restful night’s sleep. Can I take Day & Night Nurse Capsules whilst pregnant or breastfeeding? Day & Night Nurse Capsules are not usually recommended for use by women who are pregnant. It is true that paracetamol in generally considered safe to take during pregnancy. However, the safety of pholcodine, dextromethorphan, pseudoephedrine, and promethazine for use during pregnancy is not well established. Day & Night Nurse Capsules are best avoided by mothers who are breastfeeding. Although paracetamol is considered safe to use whilst breastfeeding, the other active ingredients in Day & Night Nurse Capsules may be passed into the breast milk. Speak with your doctor or pharmacist for further advice. 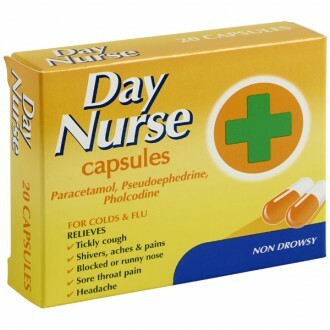 Can I take Day & Night Nurse Capsules with other medicines? You should avoid using another cough/cold medicine. 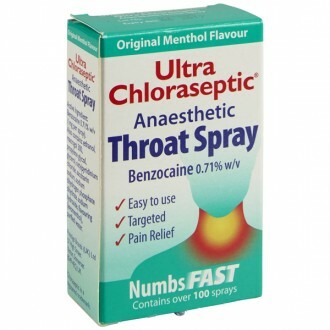 Also, you should not use any other medicine that contains a decongestant at the same time as taking Day & Night Nurse Capsules. It is particularly important not to take any other product that contains paracetamol, as this can easily result in exceeding the maximum daily dosage. Many cough and cold remedies contain paracetamol, so it is important to check the ingredients of other medicines before taking them. If you are taking any prescribed medication from your doctor, always check with the pharmacist or doctor before taking Day & Night Nurse Capsules.